Here's a profound question - should a classic, like the chocolate chip cookie, be tampered with? I mean isn't it sheer perfection on it's own with gooey semi-sweet chips enveloped in a buttery, slightly caramelized soft cookie? I'm generally a minimalist; less is more. I don't even like nuts in my cookies. However, with this rendition of the classic, there's no turning back for me. Using the Nestle Toll House recipe as my base, I added crushed Werther's Originals (hard caramels) and topped each cookie with a touch of kosher salt, a variation from the typical sea salt. Oh dear, oh my they were good! The caramels chunks melted to create a chewy sweetness with an extra rich sensation. The touch of salt enhanced the flavor palate of this cookie with deep notes of butter, chocolate, brown sugar and caramel! Furthermore, my family is finishing up a round of the flu or something awful like it. My daughter Eva was hit the hardest with a 103 temperature and deep barking cough. My son Jake and I have just suffered with a prolonged head cold and itchy throat while my husband has somehow escaped it completely. These cookies performed as the ultimate comfort food and after popping a few yesterday, I swear we all felt better. 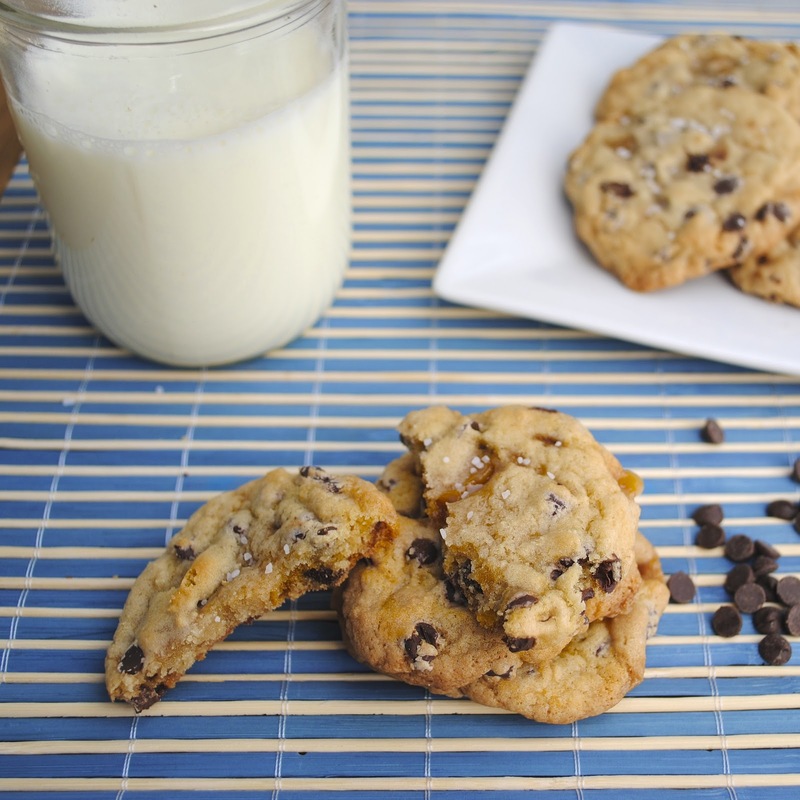 Check out my chocolate chip cookie and other comforting recipes on Food Network's blog FN Dish. Beat butter, granulated sugar, brown sugar and vanilla extract in a large bowl until creamy. Add eggs, one at a time, beating well after each addition. Gradually beat in flour mixture. Stir in chips and caramels. 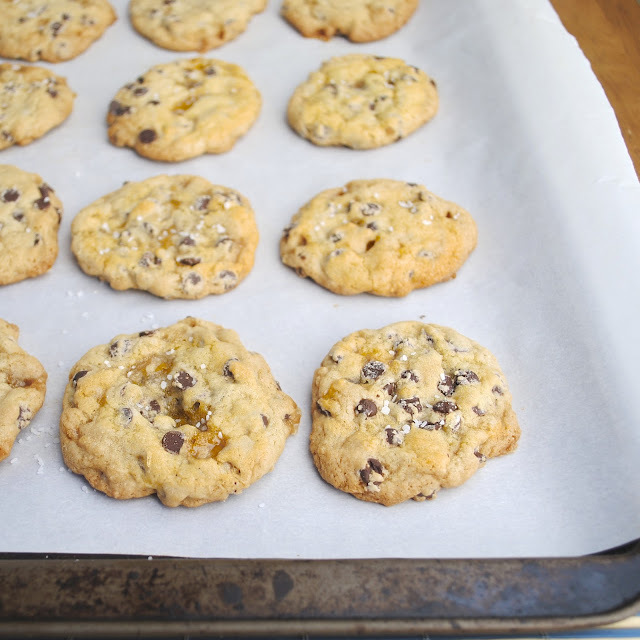 Drop by rounded tablespoon onto cookie sheet lined with parchment or a silpat. Bake for 9-11 minutes or until golden brown. Sprinkle with desired amount of kosher salt. Cool on baking sheets for a few minutes and then transfer to a wire rack. These look amazing Liz~ ohhh fab, fab! These look awesome! One of my favorite chocolate chip cookie recipes that I got from my mom is topped with sea salt as well. It just adds something so perfect to the chocolate. And I love the caramel idea. Thanks! I have a couple of questions, is it 2 1/4 C of flour, do you use salted or unsalted butter and do you use light or brown sugar? DUH! Yes 2 1/4 c . How can I read a recipe 10 times and still miss that? Good questions - I prefer unsalted and light brown sugar. If you only have salted butter cut back salt in recipe by a 1/4 teaspoon. Enjoy! These look amazing and will definitely be trying the werthers & salt combo to traditional chocolate chip cookies! Just to clarify did you mean 1 cup of butter (equal to 2 sticks) of butter? New bakers may just try 1 stick of butter and wonder what they did wrong! :) thanks for the post and lovely pictures!